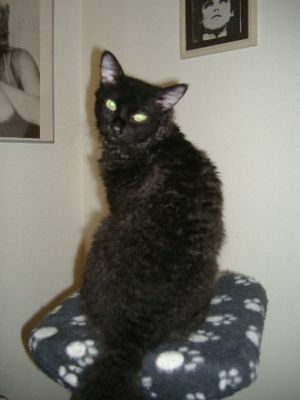 The Lykoi Cat was discovered through a gene mutation in domestic shorthair cats and is not hybrid breed. 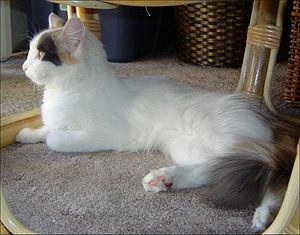 It is said to be the first cat bred for its unusual features. Bred by veterinarian Brittany Gobble and breeder Johnny Gobble, the original breeding pair came from unrelated litters. They were tested at the University of Tennessee and proved negative for the Sphynx/Devon gene and were shown to be in good health. 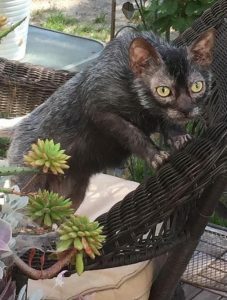 The name Lykoi is from a Greek phrase meaning “Wolf Cat”. 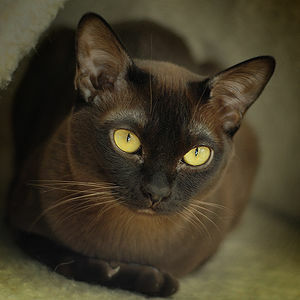 TICA (The International Cat Association) officially recognized the breed in 2012. The Lykoi Cat is not quite ready to go to the homes of adopters of these “Werewolf” looking cats. The Gobbles continue their breeding program and have placed cats with breeders in the USA, Canada and France. Before placing these cats up for adoption, the Gobbles want to be sure they have no long-term unsuspected genetic defects.